Hyundai, the car manufacturer, has released the second film in its 'inspiration. Engineered' campaign, this time promoting its new i10 model. The 40-second TV ad is released in Germany today and will then be rolled out across Europe, reaching the UK on 12 January. Much like the first spot in the campaign, called "inspiration" and released in September 2013, the new spot, "engineered", shows everyday objects flying through the air and coalescing to create the outline of the new car. The 2013 ad – which was launched to promote the ix35 model – featured objects including furniture flying through the air. The new spot features items such as trainers, headphones and gig tickets, and features Howie B’s ‘Who Got the Bacon’, in a bid to connect with a younger audience. It ends with the line, "New thinking. New possibilities." The ad, which is the second in a series of three films, was created by Innocean Worldwide Europe. The agency started life as Hyundai’s in-house agency, but last year announced that it would begin working with other clients, too. Frank Budgen, who shot "rabbits" for Sony Bravia and "tag" for Nike, directed the spot through Gorgeous. The latest spot will be backed by print, online and out-of-home executions across 30 European markets. The third and final ad in Hyundai’s 'Made Of More' series will air later this year. Mark Hall, the vice-president for marketing at Hyundai Motor Europe, said: "As with the first ad for the ix35, this film shows how much more there is to Hyundai than people may think. We’re proud to be known for our value and quality, and this campaign allows us to dig deeper into the relationship with our customers." 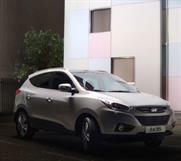 In April 2013, Hyundai was forced to apologise after an online ad promoting the ix35 that showed a man failing in his attempt to gas himself to death in his car because of the cleanliness of the ix35’s emissions. In a statement released at the time, Hyundai said Innocean Europe created the ad without Hyundai’s request or approval. Can Cheil move beyond Korea and Samsung?